It's been worsening for a while now, up to the point where one of my bosses has expressed worry that he may walk in one day to a message about me running away with a Frenchie twice my age who can handle a big knife. 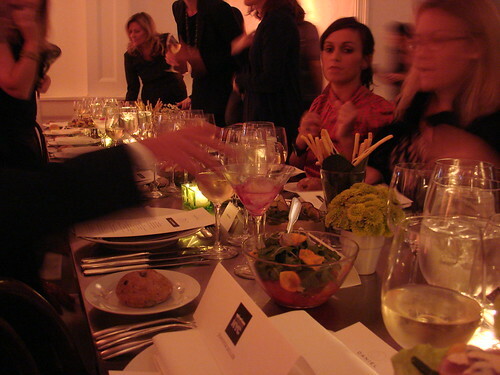 Daniel Boulud's Pop Up Dinner during Epicurious Entertains NYC did not help matters. 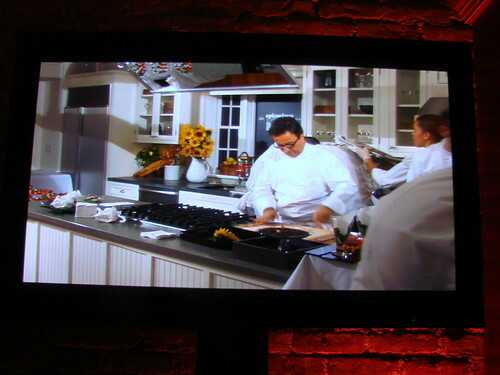 The nighttime event at Epicurious was just as well planned as The Ultimate Lunch Break-TVs showing the action in the kitchen, or if you were close enough to the kitchen, you could peer in, a signature cocktail drink, assigned seating, romantic mood lightening. To top it all off was the menu titled "Fall in Provence" prepared by the one and only D-Biggity. It was enough to make a girl want a French man to run away with. Unfortunately I was running a wee bit late that night and missed all the canapés, so we'll immediately move onto the first course. The table set-up required participation by every diner. Every four seats had to pass plates of food around so each could take a serving; this created a very communal and relaxed environment. 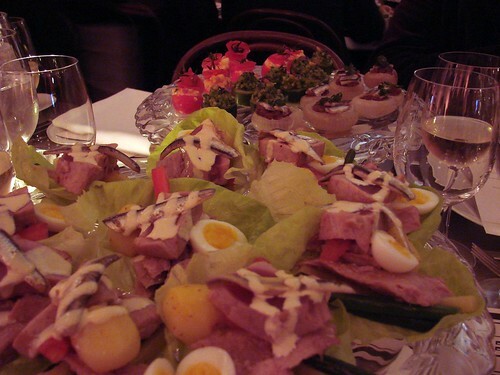 The course consisted of Tuna Niçoise with Boston Lettuce and Haricots Verts, Sardine Escabeche with Fennel, Duck and Foie Gras Cigar, Legumes Farcis: Zucchini, Tomato, Onions with Anchovies, Octopus Salad with Tomato, Cranberry Beans, and Niçoise Olives, Eggplant Babaganoush with Basil Foam and Olive Grissini. Did I try everything? No. Did I like everything I did try? Yes. I am no expert on any of these dishes, but I will say that the Tuna Niçoise, and sardines changed my mind about Niçoise Salad, and sardines-seriously good. 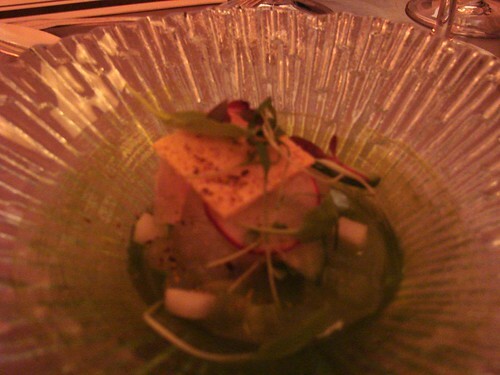 Second course consisted of Tai Snapper and Cucumber Ceviche. I am also new to Tai Snapper, or snapper of any kind. Fish has always been a food group I want to eat, know I should eat, try to eat, but then I think I'm eating a toxic, full of mercury, overfished Nemo. I can't say for sure that this was the case with Chef Boulud's fish, but in general, my fears are correct when it comes to snappers. Regardless, I ate and enjoyed the fresh ceviche. The third course was something I could get behind, a food I know and love: Rack of Lamb with Summer Vegetable Tian, Ricotta, and Panisse. Oh this juicy, tender, beautifully spiced rack of lamb, I have thought thoughts about you since our dinner. Lucky for me, another dinner guest, a certain John Del Signore of Gothamist fame, was seated across from me and the lamb was lost on his vegetarian soul. I ate most of his too. 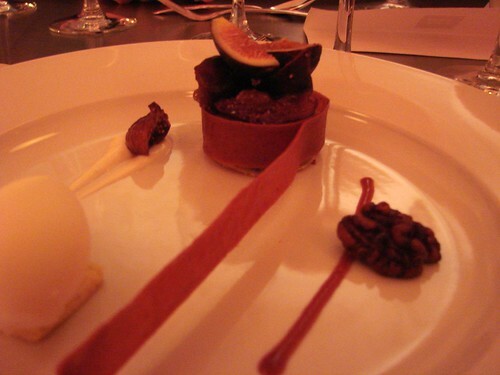 Our first dessert was Port Roasted Black Mission Figs with Caramelized Walnuts, Sheep's Milk Yogurt Sorbet, and a homemade fruit roll-up. Amazing, delicious, delicious, and good-more for decoration than dessert. Afterward I had a number of thoughts like I need to incorporate more sheep's milk products into my life; do they make regular fro-yo sorbet; and why not more sheep's milk fro-yo for the lactose intolerant peoples? But this wasn't the end, even though we had come to the end of our menu; Chef Boulud waltzed out of the kitchen, with his leather jacket one matching his devilishly good looks, and in his outrageous accent bid us all a fond adieu, with one last dessert up his sleeve. 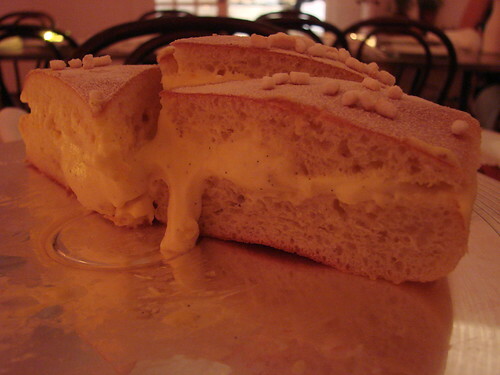 A cake, a fluffy, yet bready cake filled with vanilla cream. A simple dessert really, that was absolutely delicious and presented beautifully. P.S. Congratulations to DBGB on being Sam Sifton's first review, and picking up two stars in the process! I refuse to get behind DBGB because of its exploitative name(! ), but I can definitely get behind your fish fear. I don't necessarily care about the toxicity of it, but fishy flavor weirds me out, maybe because I was raised in Ohio on a pig farm and only ate fish approximately twice growing up. I've gotten some mean comments on my blog because of my dislike. Hooray! Hi. Amazing dishes. Reminds me one reception two years ago. There were many dishes to try. I tried only those which I knew and were great. I'm not big fish lover too but I'm not so strict about them. I think when you eat fish just sometimes it can't hurt. What a wonderful dinner. I get weird about fish too, especially ones locally caught. The pollution that runs into the water is too much, too visible and too close. French man who knows his way around offal. Oh yes, honey, sign me up. 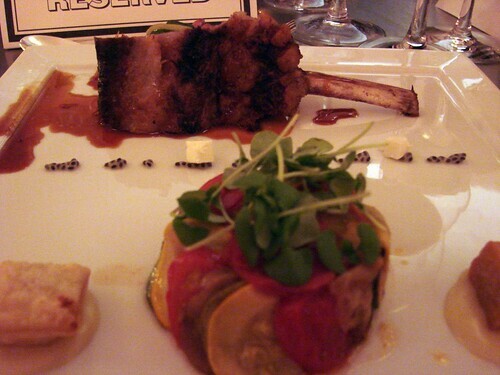 BTW, the plating of that vegetable dish made me think of the ratatouille dish in the Pixar movie.